This was a movie I was always consciously aware of when I was a kid. 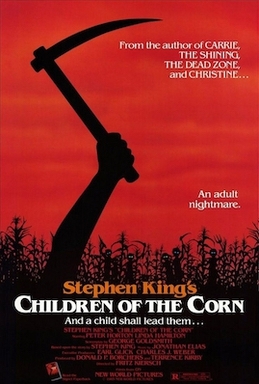 I knew a few kids who had seen it, and more than a few grown-ups had used the phrase “children of the corn” to describe my generation. I only saw this film for the first time last year. Mostly I could never make it past the scene with the deli-slicer at the beginning, but thankfully, that was really the most graphic part of the film. The rest of the movie makes it’s bank on delicious world-building and story-telling of a town of Satan worshiping children led by the charismatic mystery-child Isaac. I blame this movie for the current rash of anti-ginger sentiment.